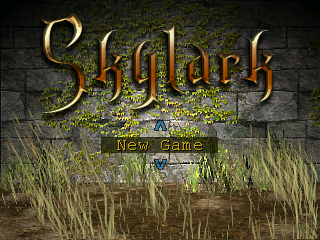 Skylark is a action RPG platformer with retro style graphics, for the Caanoo and Pandora. A man by the name Borealis, finds a young boy out in the woods, alone in the night, forsaken to his own dreary fate. The man takes the child in and cares for him. The boy seems to have an odd relation to birds, which all around befriends him where ever he goes. Hence, he names the boy Skylark. Twenty years later, Borealis gets brutally murdered by an unknown assailant. Once Skylark discovers the murderer's identity, he traces the assailant for days to an old castle, far out into the ancient woods. Skylark ventures deep into the castle, to hunt down his father's murderer. Not knowing what secrets and dangers that awaits him, he will soon discover his higher purpose, and that he is the only one who can seal the dark force that is stirring in the heart of the old castle. Your goal is to advance further into the castle, through each of the rooms, but you can always backtrack to where you have previously been. Skylark has your normal RPG stats and level progression system, and as you kill monsters you will gain experience and level up. Your stats determine your attack and defense rate. You can also find items through out the game like swords, shields and armors that you can equip to enhance your basic stats. There are several magic Tomes hidden in the castle that you will find, and these Tomes are used as skills/magic. But to use a Tome it costs Action Points and another resource called Eyes, which are basically human eyes that are used as vessels for magic energy to cast Tome spells. These eyes were infused with magic by an ancient order of black mages, that practised their rituals inside the castle, in order to contain more energy for their rituals and spells. The eyes came from human sacrifices to the Dark One.